I love it when I get my act together to actually put my fun thoughts into reality, don't you? I mean I have all these amazing ideas, thoughts and things to do around my house- but most of time time they stay just that....thoughts and ideas in my head. Yea, that's right- my new, beautiful leopard print rug for my teeny, tiny office area. More pictures of the full space to come later- just sit tight. I'm so glad you went for it! I love it. So wild, love it. Glad you did it! Yay!!! It looks so good. You are so lucky!!!!!!!! Can not wait to see it in your office. What a find. its looks great. Isn't it fun how one little rug can make us so happy! Congratulations on the new rug-looks darling. the beauty of a leopard print rug is that everything else can still be in disarray yet the space will look wonderful :) can you tell i'm a leopard print fan?!?! Just wanted you to know that I gave your lovely blog an award (or two). I'm still amazed about how organized you are! I love all those boxes! 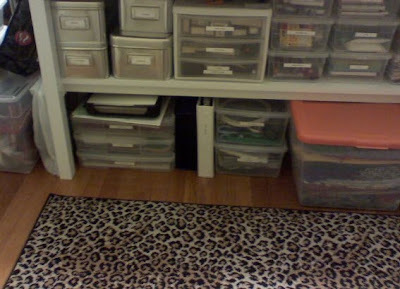 I want to be organized too... And the rug is fab!! Hope you've had a wonderful weekend!! Looks great, I am still in awe of that organization! I wish I had never let my "wild side" rug go. I knew something wild was in store when you posted those cougar spots in several posts prior! Looks like a grrreat choice.